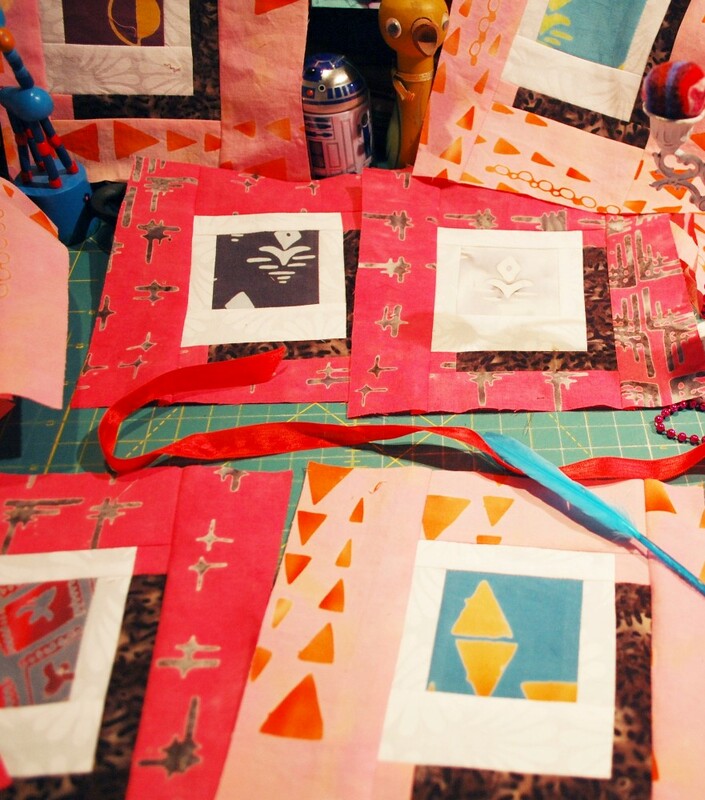 Tie One On Blog Hop Day 9 - Wrapping Up with the Amazing Go Go Kim! And last but certainly far from least, it is now Tie One On Blog Hop Day 9. 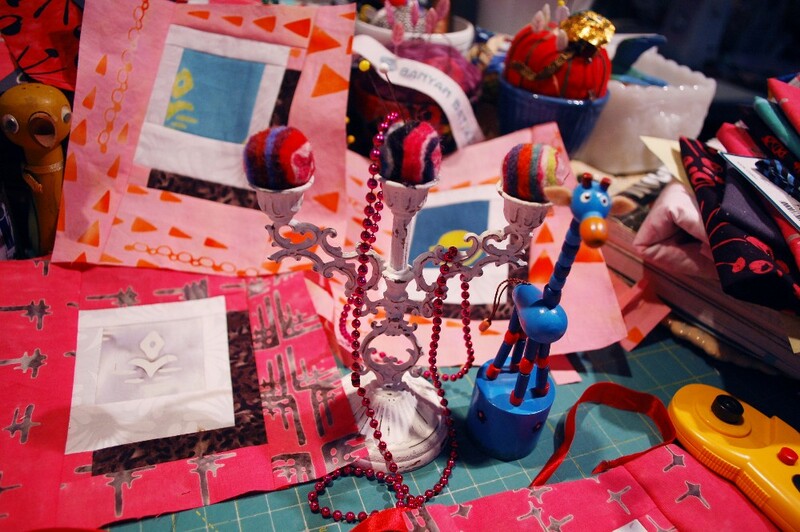 I have been really enjoying all of the Tie One On projects and the New York Beauty quilt by Kim Niedzwiecki of Go-Go Kim Fame is a great way to wrap up the week. I love how Kim reorganized the colors of the different colorways into a rainbow in the photo below! Gives a whole new fresh look to them and reminds me how much I love their deep saturated “un-muddy” colors! Kim’s project also gives a nod to the “circle” of life / friendships / sewing projects that this Blog Hop brought about. I’m so looking forward to the next phase of the collection’s life, when it gets into the shops where you can work your magic with them! Make sure you go to Kim’s Blog post here to see her New York Beauty and get hints and tips for a more stress-free approach to that traditional block (which by the way Kim’s block feels unique to me somehow). Plus of course you can comment on her post to get your chance to win a Fat Quarter bundle of Tie One On! Now for today’s Blue Nickel Visual Contributions for the Tie One On Blog Hop Day 9 …. Here’s a little pincushion by Sally from Costco (again) 😉 Sally decoupaged a little clay pot and saucer with tiny scraps and made a pincushion! 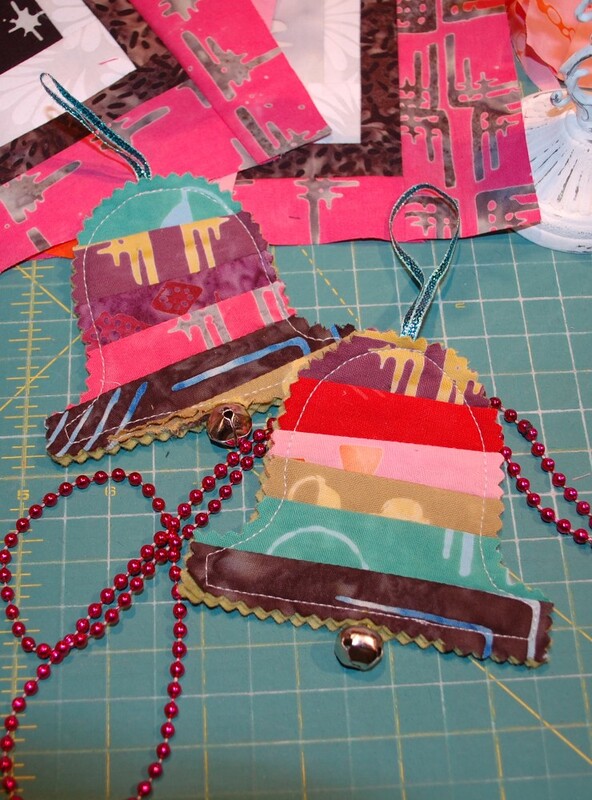 She also made some Christmas ornaments which is a great way to use up the scraps from other projects. And the fabric is hitting the stores just in time! I have started making these Polaroid blocks for a little wall quilt. I had hoped to be done in time for the Blog Hop, but it’s not there yet as you can see. Keep an eye on my Instagram feed and look for it there in the upcoming month. The lighting is just a bit too yellow here; I tried to adjust but this is as good as I could get. Make sure you stop by each of the stops on the Blog Hop tour! Each Hopper has their own drawing date so make sure you get to them all right away. A few of them are drawing close to this end of the Hop. 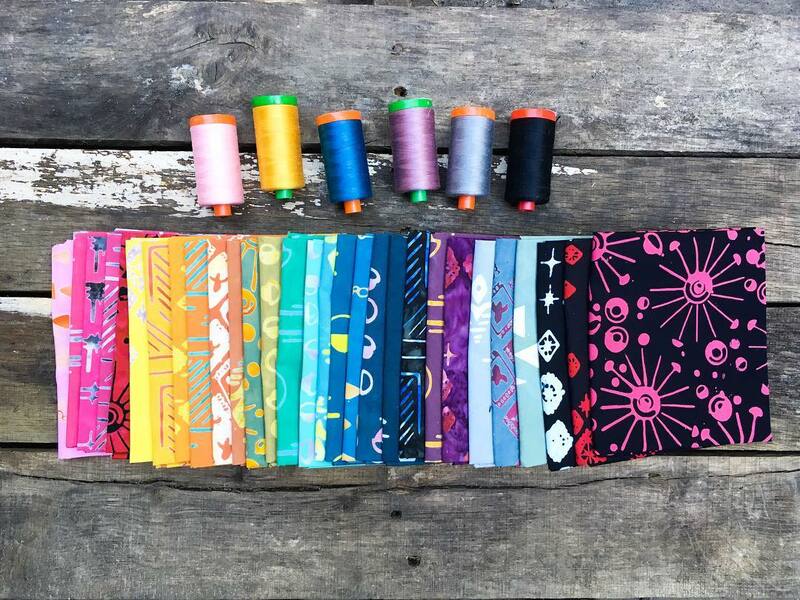 They will each be choosing one winner of a fantastic bundle of Tie One On Fat Quarters! A few of them have added in their own prizes as well. And one commentor from each of my blog posts ABOUT these mighty fine peeps will win some little treat as well. I forgot to put draw dates on my posts, so I will draw names Wednesday or Thursday of the coming week. There are lots of ways to win. Here’s the list of my Hoppin’ friends in case you missed them. 9/30 – Kim Niedzwiecki — That’s TODAY! I hope that you enjoyed the Blog Hop and even more, I hope you totally dig the fabric when it hits your local shop. 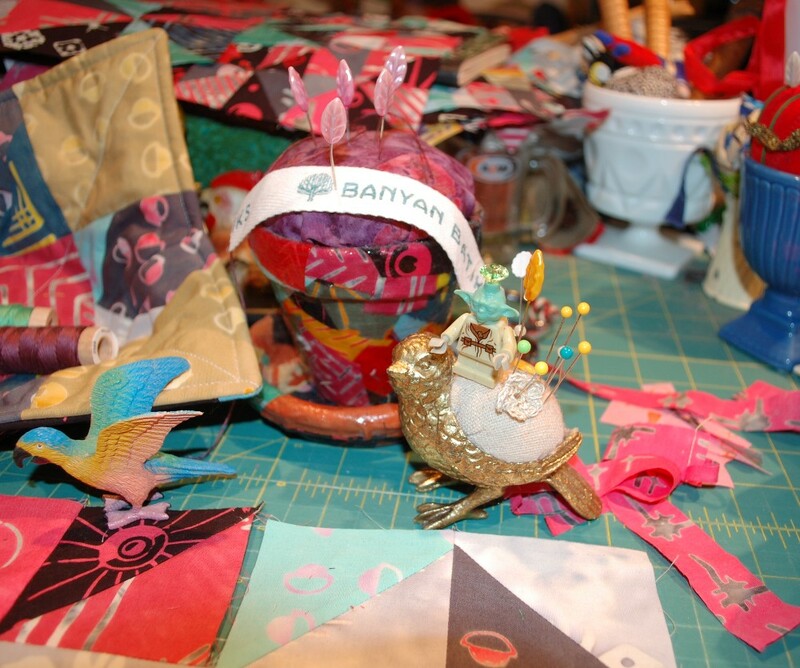 Make a lot of stuff and please feel free to tag me on Instagram with @bluenickelstudios and hashstag your pix with #tieoneonfabric #bluenickelstudios #bluenickelbrigade #banyanbatiks I know you will rock the town with your creations! I love the final project! So sorry to see the hop end, though. It was fun meeting new to me bloggers and seeing what everyone came up with! Thank you Scott for the awesome Blog Hop. I really enjoyed seeing all of the beautiful projects everyone made from your fabrics. I also loved all the projects you have shared with us so thank you for that. Kim’s New York Beauty is just that–a beauty. I have only tried curves one time and it was a total disaster. She did a wonderful job, and the fabrics look great.. 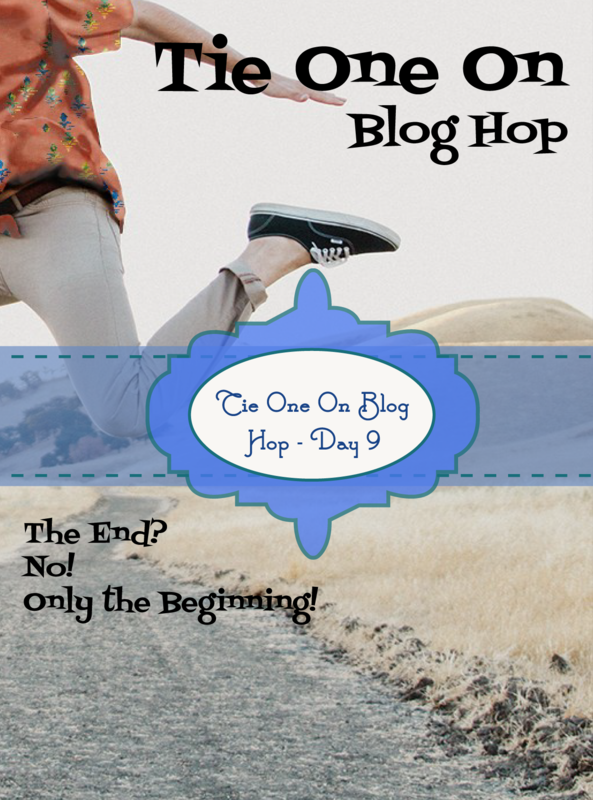 I have really enjoyed this blog hop. So many great projects! Kim’s quilt is amazing and I love Sally’s ornaments. It’s time for ornaments. Thanks for ideas. This was great! Thanks for doing it! You have sufficiently whet our whistle for your fabrics! I love the ornaments out of scraps and the apple placemats. I did a double take on what fabrics they were made from. Seeing them out of their own collection “box” changed the game up. Fun! I love Kim’s New York Beauty. So lovely. Thank you for a great blog hop. You have provided a lot of inspiration here with the rug, the Polaroid blocks and the bell ornaments.